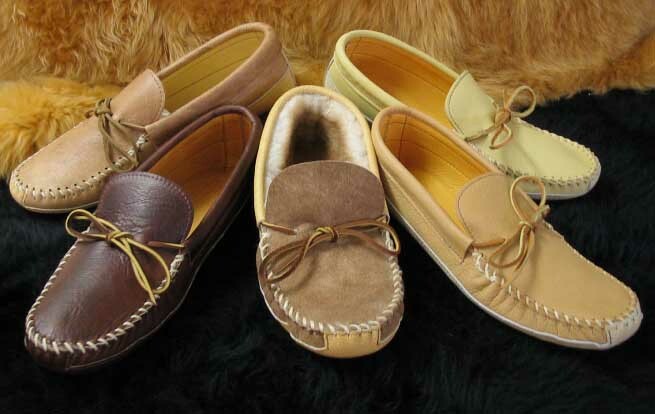 Fish Creek Moccasin’s known for our high-quality handmade moccasins. We can accommodate unique and challenging foot shapes and sizes. We can provide repair work for anything that we have made. Other repairs may or may not be accepted depending on the capability of our machines. Fish Creek Moccasin Works creates handmade moccasins from a wide variety of high-quality hides, vat-dyed, and pre-stretched to preserve color, fit, and feel. We can make custom orders from deerskin, elk hide, cowhide, pigskin, sheepskin or an even wider variety if you ask. We can even use your pre-tanned hides so that we can create a truly unique custom product for you. Learn more about our story, here. We encourage you to visit or call us to discuss the time, material, and pricing requirements for the custom-made products. Let us help you create special product that you’ve been thinking about! Fish Creek Moccasin Works located at The Settlement Shops is where production is currently. For custom orders please contact Jim at that location. Please call for listed hours.